LARAMIE, Wyo. (AP) _ After Wyoming pulled out a gutty 45-43 victory over San Diego State to win the Mountain West Conference Tournament in March, UW head coach Larry Shyatt praised his team for following its steady, defensive-minded game plan. Those “other people” include many college basketball analysts and coaches who yearn for the pace of play to speed up. 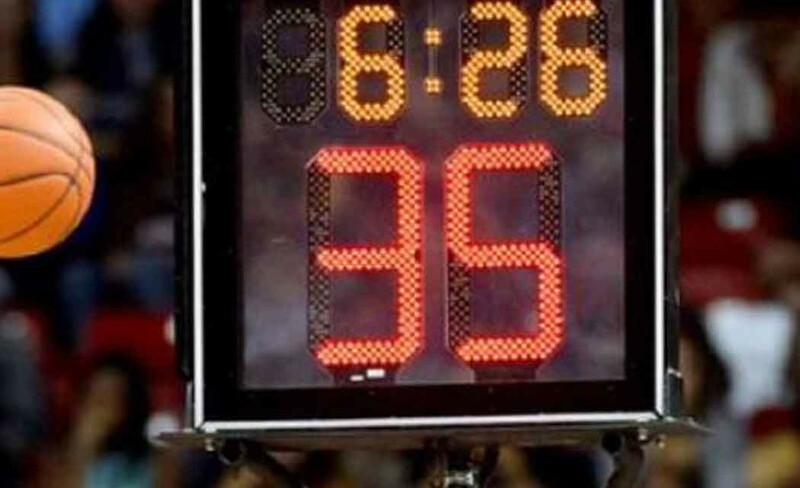 Eventually, the movement for more possessions and more points led to the NCAA Men’s Basketball Rules Committee’s decision last week to recommend a reduction of the shot clock from 35 seconds to 30. According to basketball statistician Ken Pomeroy, Wyoming ranked 343rd in adjusted tempo (possessions per 40 minutes) among 351 NCAA Division I teams in 2014-15. But could the rule _ which awaits approval by the NCAA Playing Rules Oversight Committee on June 8 _ actually help methodical teams like UW? Jones’ team, which ranked 337th in adjusted tempo, played four games with a 30-second shot clock this postseason while reaching the National Invitation Tournament semifinals. The NIT, College Basketball Invitational and CollegeInsider.com Postseason Tournament each experimented with the anticipated rule change. Possessions per game increased by 1.02, while offensive efficiency improved by 0.6 points per 100 possessions. Not an overwhelming difference. “There were a few more possessions, probably a few poorer shots and maybe 0.5 shots more made,” Shyatt told the Casper Star-Tribune (http://bit.ly/1LwyZKV). Wyoming thrives on forcing poor shots, and with a young team set to include at least 11 underclassmen, it will especially want any possible advantage. The reasoning behind the shorter shot clock is exactly as it seems: quicker shots means more shots, which should amount to more points. Right? “I think that just shortening a shot clock, obviously we’ll have more possessions in a game, but I don’t know if the quality of those possessions will be any better or worse,” said Tennessee-Martin coach Heath Schroyer, whose team ranked 301st in adjusted tempo and played four games in the CIT. Schroyer, who coached Wyoming before Shyatt, is under the impression that the committee’s several other recommendations _ namely a renewed emphasis on reducing physicality _ will produce the desired effect of higher scores. During the three lower-tier postseason tournaments, the shot clock proved most noticeable when teams employed zone defenses. Most commonly, after made baskets and free throws, teams applied soft, three-quarter-court pressure and transitioned into a zone defense. The object is primarily to take time off the shot clock, not to force turnovers. The converse of winning a conference tournament championship game 45-43 is that Wyoming only scored 45 points. Steady, unhurried teams often take pleasure in breaking an opponent’s will by frequently scoring in the waning seconds of the shot clock, essentially wasting 30-plus seconds of defense. National runner-up Wisconsin _ which ranked No. 346 in adjusted tempo _ and Virginia _ which spent time atop the Associated Press poll and finished 349th in adjusted tempo _ did that time and again in 2014-15. So did Northern Iowa, which ranked 348th in tempo and ended Wyoming’s NCAA Tournament run. The question now is, can those teams still operate efficiently and deliberately with five less seconds allotted per possession? For another low-tempo team like Air Force, which runs a variation of the Princeton offense, those five seconds could prove more costly. That particular offense is predicated on getting open shots by running repetitive movements and eventually losing defenders. But across the board, the new shot clock _ reduced for the first time since it was trimmed from 45 seconds to 35 in 1993-94 _ won’t have a drastic impact. Sure, it might help Wyoming marginally on the defensive end, but the real influence will come from the reduction of timeouts and the curbing of physicality.